Abstract: Lee Koppelman was the first Suffolk County Planner, hired by the first County Executive, H. Lee Dennison. Koppelman served for twenty-eight years as county planner and forty-one years as regional planner for Nassau and Suffolk. Now Koppelman heads the Center for Regional Policy Studies at the State University of New York at Stony Brook. This article is based upon extensive interviews and addresses Koppelman’s professional career, his philosophy and strategy of urban and suburban planning, including the influence of Lewis Mumford. Dr. Lee E. Koppelman’s name is synonymous with the planning and development of Long Island in the second half of the twentieth century. For twenty-eight years (1960-1988), he was Director of the Suffolk County Planning Department and for forty-one years (1965-2006), the Nassau-Suffolk County Regional Planning Board Executive Director. Koppelman was a planning gymnast, contorting and twisting his way through the development of the post-World War II period on Long Island. While he is no longer involved in the day-to-day maneuvering of Long Island planning, if you think that means Koppelman is retired you would be sadly mistaken. Sitting in a seventh-floor- office overlooking the campus at the State University of New York at Stony Brook, Koppelman serves as Executive Director of the Center for Regional Policy Studies. His charm, memory for details and quick wit are very much intact in this 82-year-old master planner. Today, from his top floor office in the Center for Regional Studies at Stony Brook, Koppelman continues to survey the landscape. The Stony Brook campus has green space, and ornamental trees lining serpentine paths that direct both students and faculty to their scheduled appointments. The design speaks to order and planning and one imagines that the planning side of this landscape must appeal to Koppelman. Born in Harlem, New York on 124th Street and 7th Avenue at Sydenham Hospital, Koppelman was the son of an Austrian immigrant. His father, Max Koppelman, was a florist and landscape designer by trade. Max left Austria, and immigrated to the United States after having first failed to immigrate to Palestine following the First World War. Although born in Manhattan, his family lived in Astoria, Queens. It was in Astoria near his green houses on 41st street that Max Koppelman’s business blossomed. He made a good living managing the small penthouse gardens of clients like Benny Goodman. There was also work at a film studio in Astoria as well as at some the Gold Coast estates on the north shore, where he maintained the gardens of Fannie Brice. It must have been easy for Max’s young son to see what someone could do on a small scale with flowers and plants. A comfortable living was possible if one took the time to design a space that suited the needs of the client. From the examples of both the Manhattan penthouses and the Gold Coast estates, it is clear that Max’s son would come to appreciate the art of planning and design. Those same elements of planning and design could help shape the human environment on a much larger scale. It was by chance one day in the Astoria Public Library that Koppelman came across the work of Lewis Mumford. It was Mumford’s Technics and Civilization (1923) that first fascinated Koppelman. The work centered on how technology and urbanization affected human societies. “I loved his prose style,” said Koppelman referring to Mumford’s later work The City in History (1961). Koppelman read Mumford the way other boys of the same period may have read comic books or the works of Zane Gray. Lewis Mumford was a writer, historian, philosopher and even an architectural critic for the magazine, The New Yorker. His reflections and thoughts on environmentalism and regional planning were evident in his writings from 1922 until his last work sixty years later, Sketches from Life: the Autobiography of Lewis Mumford (1982). In 1923, it was Mumford who helped co-found the “Regional Planning Association of America.” This organization stressed the notion of “limited development” as part of city planning. While initially attracted to Mumford’s rhetorical style, Koppelman was also taken with the substance of his work. Koppelman earned a degree in electrical engineering in 1950 from the City College of New York (CCNY). Despite this degree, he was drawn to the passion of his father. A career as a landscape architect came with the understanding that it could be both personally rewarding and profitable if one was willing to take the time to perfect the craft. By the mid-1950s, he was engaged in a successful landscape architecture business, married and living in Suffolk County in the unofficial village of Hauppauge, almost directly in the center of Long Island. It was there, in 1958, that Koppelman agreed to help the Hauppauge community develop a plan to prepare for the urbanization heading inexorably out from New York City. The community plan was difficult because of the political boundaries that comprise the area of Hauppauge. Hauppauge was (and still is) divided between the townships of Smithtown and Islip. The coordination of two political entities would prove a challenge. The Hauppauge community had no mayor, village officials, village green or even a library. Hauppauge was simply the area that made up the Union Free School District Number Six. As President of the Hauppauge Civic Association, Koppelman developed a comprehensive plan for the development of residential, commercial, and industrial interests while also showing a concern for the preservation of open space. This plan included school population projections that determined land acquisition sites for future school construction. Local referendums secured the land purchases at values far below what the cost would be in just a few short years. The community plan also took into account the need for improved fire protection in the new industrial and commercial areas as well as in the expanding residential areas. The building of auxiliary fire stations located along major transportation arteries was planned even before the need arose. The entire development plan was envisioned at a time when Hauppauge was still very much a rural community divided between turkey farms, agricultural land and vast wooded acres. Many of the Hauppauge homes and churches in 1950 dated back to the early part of the nineteenth century. The Hauppauge master plan resulted in the construction of an industrial park that is still one of the largest in the country. This industrial park provided jobs for thousands of people, many of whom resided in the residential areas of Hauppauge, tucked safely away from the bustle of the industrial traffic. It was at a gathering in the Village Hall in 1959 to discuss Hauppauge’s new development plan that Koppelman met H. Lee Dennison, the newly elected and first Suffolk County Executive. Both men exchanged their views and commented on the Hauppauge plan as explained by Koppelman. The centerpiece of the meeting was Koppelman’s spiral bound twenty-six page study entitled “Hauppauge A Master Plan.” This comprehensive plan for such a small community must have impressed Dennison. Within a week, Dennison called to invite the President of the Hauppauge Civic Association to come on board as the county planner. At a time when most of the ten towns in Suffolk County had no planning department at all, the position of county planner would be both critically important and demanding. Most planning on the town level at the time was done in crisis management style, dealing only with those most pressing needs as they arose. There was no central or long range planning process, and no professional planning staff. Koppelman took a few days to decide but agreed to join the Dennison administration. Koppelman’s tenure would last for twenty-eight years, spanning all the county executives, be they Republican or Democrat, until he left the position in 1988. The first Suffolk County Executive and the first Suffolk County Planner shared one desk in the inaugural year of the county government. Koppelman was quick to assess the needs of the county and to provide a comprehensive plan of what could and should be done. The first task for the new county planner was to update the maps of all ten towns in Suffolk County. With that task completed, the planning part of the job began in earnest. The challenge at the time was balancing the competing demands for housing, transportation corridors, public facilities and energy needs while also envisioning future commercial and industrial development, coupled with preserving open space. It was similar to what he had done for the Hauppauge community plan, only on a much grander scale. a multitude of uniform, unidentifiable houses, lined up inflexibly, at uniform distances, on uniform roads, in treeless communal waste, inhabited by the people of the same class, the same income, the same age group, witnessing the same television performances, eating the same tasteless pre-fabricated foods, from the same freezers, conforming in every outward and inward respect to a common mold manufactured in the central metropolis. Thus the ultimate effect of the suburban escape in our time is, ironically, a low-grade uniform environment from which escape is impossible. Mumford believed that urban planning should stress the organic relationship between people and their living spaces. Koppelman would still be citing references to the work in the Third Nassau and Suffolk Counties Comprehensive Plan 2000-2030, published in 2007. Koppelman’s degree in planning was quickly followed by a doctorate in Public Administration from New York University in the late 1960s. 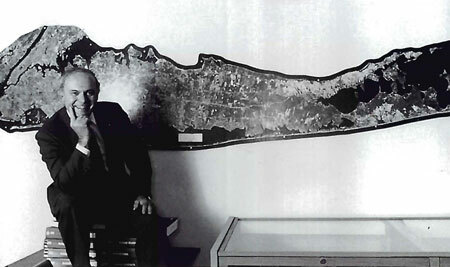 As Koppelman explained, “I needed to understand how government worked, how much money goes into a capital budget, operating budgets and the relationship between state and local municipalities.” His doctoral thesis focused on the topic of Coastal Zone Management and would forever anchor his career to the coast environment that is the Long Island region. Not all of Koppelman’s ideas were eagerly embraced. His idea for a major commercial airport in Calverton, his consistent call for affordable housing, or a Cross- Sound bridge were not well received. Some proposals, like the preservation of farmland preservation and open space, that were criticized early on as foolish are now the standard for preservation efforts all across the country. Once viewed as only suitable for a waste site, his effort to preserve wetlands on Long Island led to the creation of New York State’s Tidal and Wetlands Act of 1972. Ground water preservation efforts were undertaken after studies revealed Long Island’s aquifers were finite and that waste disposal affecting that ground water had to be minimized. Koppelman’s concern to safeguard the fresh water supply centered on lessening environmental contaminants, ranging from landfills, to fertilizer, pesticide use, and even to the storage of gasoline and oil. His concerns with the purity and protection of Long Island’s water supply eventually focused on efforts to the preserve the Long Island’s Pine Barrens region. As with all of Koppelman’s suggestions, his planning was the result of research based on the most current scientific data. The research findings provided the planning department and Koppelman the necessary momentum in their struggle to get things approved even if the prevailing political winds did not always blow in their favor at first. 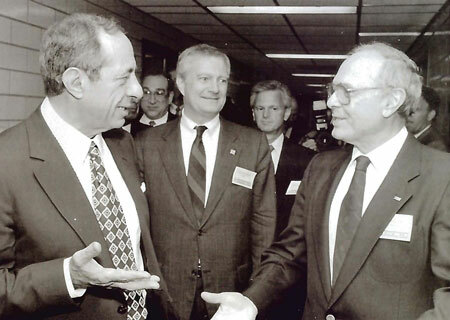 Figure 2: Mario Cuomo, Governor of New York, Dr. John Marburger III, Stony Brook University President, and Dr. Lee Koppelman (from left). The years have softened Koppelman’s physical approach to dealing with shortsighted developers and politicians, yet he still manifests contempt for those who serve only themselves and lose sight of the public good. Even today, Koppelman is quickly annoyed by wastes of both time and energy. He remains fiercely adamant that comprehensive professional planning is an essential part of any good government and rejects the idea that regional planning is the antithesis of local control. Throughout Caro’s work, it becomes obvious that he respected Koppelman as a “Master Planner” in contrast to Moses, a “Master Builder.” In Robert Caro’s mind, there was a difference between the titles. Moses captured America’s popular imagination with the construction of vast public works like bridges, tunnels, highways and parks, while Koppelman’s vision lacked the popular appeal of many a Moses plan. Koppelman’s designs were rooted in research that indicated a real need for improved mass transit and cluster zoning to preserve the rapidly vanishing open space but Moses spoke to the popular post World War II ideal of single-family houses and a culture linked to the automobile. Koppelman’s proposals were not as popular simply because they reflected the needs of the future more than the attitudes of the present. In the 1960s, while the construction of the Long Island Expressway snaked eastward from the city, Koppelman was expounding the need for the development of county bus service. He also proposed a rail transit system to run along the spine of the Long Island Expressway, a plan that Moses immediately dismissed. The research projections forecast that central rail service would move greater numbers of suburbanites faster and more efficiently than any roadway. When proposed, Koppelman’s mass transit line had long-range vision but was short on popular support. There was a time when cars zipped along the uncluttered expressway. Now, almost 40 years later Koppelman’s plan looks more like the work of Nostradamus than that of a regional planner. The expressway has evolved into a “distress way” with no mass transit alternatives to ease the traffic burden. 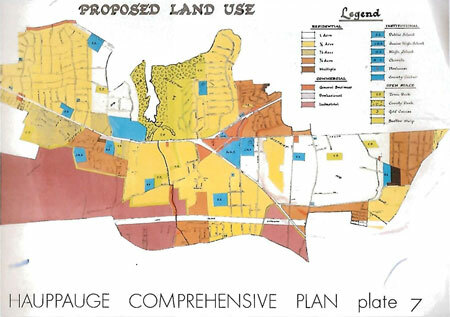 The idea to develop the Nassau-Suffolk Regional Planning Board came in the early 1960s and became a reality in 1965. It was obvious that cooperation of the two counties could result in more comprehensive regional planning in dealing with mutual problems, like transportation, water resources, energy conservation, waste management and preservation of open space. These concerns, coupled with a fast growing population, were the same issues that helped spawn the national environmental movement of the 1970s. It was the Nassau County Executive, Eugene Nickerson, and Suffolk’s H. Lee Dennison who decided to appoint Koppelman as executive director of the new agency. Koppelman agreed to serve in this position without compensation. In his tenure from 1965-2006, Koppelman orchestrated three comprehensive plans for the bi-county region. The first plan, released in 1970 covered planning initiatives from 1985-90, the second plan covered the years 1990-2010. A third regional plan was released in 2007, a year after Koppelman left as executive director of the Nassau and Suffolk Counties Regional Planning Board. This plan spanned the years 2000-2030 and, as before, made suggestions for regional planning and development. Although Koppelman was no longer executive director, his office at The Center of Regional Policy Studies at Stony Brook led the drive to complete the publication. There is a love for Long Island that emanates out of any planning proposal Koppelman endorses. While many of his political friends and opponents have left the island to retire to warmer climes, Koppelman still lives and works on the island he cherishes. He grew up in Queens, spent time in Hauppauge, then Smithtown, and now lives in Setauket close to the college campus where he teaches his classes on planning and regional studies. Koppelman’s tenure as an educator spans twenty-two years. As teacher and mentor at Stony Brook University, he is shaping the next generation of local and regional planners. His Site Planning Standards (1978) and Urban Planning and Design Criteria (1982) are standard texts and mandatory reading for any course in urban planning. In every field there is an essential text, a philosophical statement that can be argued and debated but that still must be read. In regional planning or coastal zone management, your starting point is Koppelman. You may agree or disagree with his ideas but do not begin a serious discussion without first examining Koppelman’s planning philosophy. To look around his Stony Brook office today, you get the impression that he has a sense of his accomplishments. Having moved into his ninth decade, Koppelman is fully aware that he has completed his last comprehensive regional plan for Nassau and Suffolk. Adorning the walls of his office are honorary doctorates from numerous academic institutions and acclamations both large and small. He has commendations from the Boy Scouts, numerous environmental groups and the American Institute of Architects. There is a gold medal from the Long Island State Park Commission, which causes Koppelman to smile broadly. Yet, Koppelman is not all that impressed with the awards, “they are given to both the noted and notorious,” he says but “I did like the park that they named for me in Montauk. 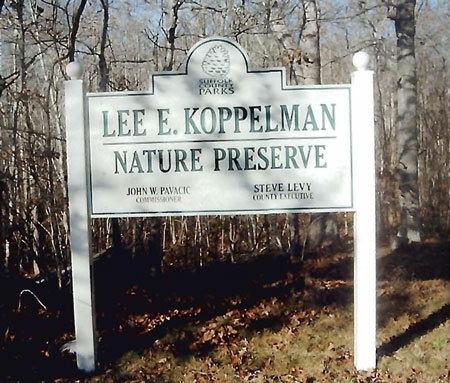 That was very special.” The Lee E. Koppelman Preserve of some seven hundred seventy seven acres, adjacent to the Hither Hill Park and Hither Woods Preserve is that which Koppelman finds the most moving tribute to his life and his work. Maybe it is because it was one of the first acquisitions in the county to protect groundwater or maybe it is just the idea of open space, wildflowers and native plants that moves this master planner. About this tribute, Koppelman says jokingly, “I presume the politicians wanted to make it posthumous.” Max Koppelman would be proud in how far the family has come. It is a long way from the small Koppelman gardens in Manhattan to the vast Koppelman Nature Preserve on Long Island’s east end. There are other keepsakes in Koppelman’s office not entirely associated with his years of public service but nonetheless very significant. Nestled among the accolades and awards are photos of his family, his wife Connie, children and grandchildren on a table close to his desk. There, alongside his family photographs, is a photo of Dennison, the man who first hired him for public service in 1960, and a man he still holds in high esteem. Above the photos is a painting by Jean Dennison, Dennison’s wife. Koppelman looks at four lithographs on the wall and says, “I picked them up in Italy during an international planning conference in 1962. Not very expensive” he says “but this one shows some wonderful architecture, the Great Synagogue in Rome.” He has bound copies of all his works, (including his most recent work, Fire Island National Seashore: A History (2008), co-authored with Seth Forman) in a Plexiglas case near his desk. Included with his personal works is a copy of the Power Broker (1974) and Master of the Senate: the Years of Lyndon Johnson (2003) both written by his friend of forty years, Robert A. Caro. Everything in his office is neat, tidy and in its place. Every photograph, painting, or accolade has a story and a purpose in his office space. Natural light streams into the room from large windows located behind his desk illuminating his work area. The electric eye automatically shuts off the lights when it senses no movement in the room and, says Koppelman, “It prevents me from wasting electricity.” The office is the very definition of organic relationship between the person and his living space and conveys to the visitor a sense of planning and design, as anyone who knows Koppelman would expect. Dr. Koppelman supplied much of the personal information over a series of interviews and telephone conversations conducted on August 31, September 1, September 22, November 12, November 30, and December 1, 2009. A video interview was taped at Stony Brook University on September 23, 2009; see the Interviews section of the LIHJ. Lee Koppelman, interviewed by the author, Stony Brook, New York. 30 November 2009. Lewis Mumford, The City in History: Its Origins, Its Transformations, and Its Prospects (Harcourt, Brace and World, 1961), 486. Lee Koppelman, interview by the author, Stony Brook, New York, 22 September, 2009. Frank DeRubeis, interview by the author, Smithtown, New York, 7 August 2009. Bruce Lambert, “The Master Planner’s Big Picture,” New York Times, May 30,1999. Bruce Lambert, “Long Island’s Master Planner Leaves Regional Board Post,” New York Times, May 13, 2006. Bruce Lambert, “The Master Planner’s Big Picture,” New York Times, May 30, 1999. Robert Caro, The Power Broker (Knopf, 1974) 578. Lee Koppelman, Third Nassau and Suffolk Counties Comprehensive Plan 2000-2030 (Center for Regional Policy Studies, Stony Brook University, 2007), 8. Lee Koppelman, interview by the author, Stony Brook, New York, 4 September 2009. Lee Koppelman, interview by the author, Stony Brook, New York, 13 November 2009.